With the end of the American Civil War on April 9, 1865, slavery was abolished and African Americans were afforded civil rights. They were free, but their situation was extremely precarious. In the south, xenophobic sentiment manifested against them in the form of significant acts of violence. In the north, society was disinterested in their cause so much so that they encountered great trouble accessing voting booths. There was a lurking undercurrent of racism, evident by the army who continued to propagate discrimination that ostracized and marginalized men of colour 1. These men had become free, but not free to find work which was refused to them, or seek shelter outside of the unsanitary housing conditions they were forced to live in because they could not afford to move into decent accommodation. Some of them even came to regret their new found freedom 2. In such a terrible context, these men managed to achieve greatness despite their grim situation. Thanks to their courage, willpower, perseverance and self-sacrifice, and despite the adversity they encountered, some managed to embark on remarkable careers. It is the story of three of these men, who became dentists that I will relate to you. George Franklin Grant (1846-1910) in 1870. Photograph taken from Harvard student annual 3 (public domain). Robert T. Freeman (1846-1873) was an African American born in Washington DC, the son of a slave family. As a young man, a local dentist by the name of Dr Henry Bliss Noble hired him as an employee. Freeman rose to the rank of dental assistant, after which Dr Noble encouraged him to pursue a career in dentistry to help alleviate the suffering of his co-religionists. After several attempts at entering two dental schools to pursue his studies, Freeman arrived in Boston to ask for a meeting with the Dean Nathan Cooley Keep 4 (1800-1875). On the recommendation of Keep, Harvard University decided that colour should not be a barrier for the admission of a student. 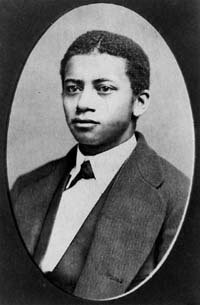 Robert T. Freeman was then accepted at the age of 22 and was one of 16 students chosen for the first class of a new dental school at Harvard, the fifth dental school opened in 1867, referenced in the territory 5. He earned his diploma in 1869 6, and was the first African American to graduate from a dental school 7. With his Doctorate in Dental Surgery in hand, he returned to Washington to open his own Dental office in the same building as his mentor. He died four years later 8. George F. Grant was born September 15, 1846, in Oswego, New York. His parents were former slaves. At the age of 15, a local dentist by the name of Dr Albert Smith, engaged his services as a delivery boy. He quickly became a laboratory assistant and Dr Smith encouraged him to pursue a career as a dentist. He entered into the Harvard Dental School in 1868, and was part of the same class as Robert T. Freeman. He graduated in 1870, after which he became the first African American to teach within the Harvard Dental School in 1871. He spent 19 years there, specializing in the treatment of cleft palates. His first patient was 14 years old and in 1889, he treated around 115 cases. He patented a “shortened palate”, a prosthetic device which allowed a patient to talk much more easily. He was the founder and president of the Dental Society of Harvard, and a member of the Student Association of the Harvard Dental School for which he was elected president in 1881. A passionate golfer, he also patented 9 a tee carved from wood and covered in gutta-percha. He died in 1910 from a liver disease 10. William Thomas Jefferson (1864-1925) was born in Washington DC. In 1886, he began his dental studies under the direction of Dr Frederick B. Mill in Bermingham, Connecticut. In autumn 1889, he entered the dental department of Howard University in Washington DC, but, in March 1890, he requested a transfer to the dental school of Chicago where he earned his diploma on March 24, 1891, after which he settled in Chicago. After joining the Knights of Pythias 11, he joined the D company of the 9th Battalion on April 1, 1895. In May, he was unanimously elected second lieutenant, and then lieutenant on November 4 of the same year. During the American-Hispanic war which broke out in 1898, Jefferson was promoted to Captain of the D Company on July 21. Unfortunately, two months later, he contracted Malaria and was hospitalized 12. Despite this, he continued to serve with his regiment in Cuba, then in San Luis in February 1899. In addition to his duties as a line officer, William occupied himself with the dental hygiene of the men of his regiment. He wrote of his experience during the war in the following manner: “During my service, I realized the necessity for a dentist and gave my services to the hospital for officers and soldiers of the 8th Illinois regiment, the 23rd Kansas and the 9th Louisiana.” Dr Jefferson was in all probability the first Black dentist to practice dentistry in the American army. He was discharged from his regiment in Chicago on April 3rd, 1899. He continued his military career within the Illinois National Guard until 1916 and was named inspector of training for light infantry at the rank of Lieutenant 13. On September 3, 1899, William returned to his Dental surgery on State Street, Chicago, where the sign on the front of his surgery read “Golden crown and bridge specialist”. He tried very hard to contact members of government at the time to create a regiment for coloured men, but without success. William Thomas Jefferson died in Chicago on October 26, 1925 14. Dental officers, 92nd Division, 1918 15 (public domain). Following the American-Hispanic war (1898), in light of the gravity of dental problems encountered by the soldiers, a decree was announced on February 11, 1901, which made Dr John Sayre Marshall a superior officer and the first dentist under contract in the American army. On April 20, 1906, Dr Leonie von Meusebach-Zasch became the first female dentist to work for the army. However, it was not until March 3, 1911, that the Dental Corps was officially established in the American army 16. 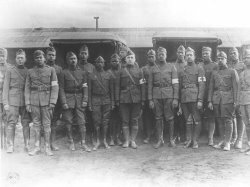 If Dr Jefferson was not in fact the first Black dentist to practice dentistry in the American army, he was certainly among the very first, well before the statute that officially sanctioned dentists within the army in 1901. With the election of Barack Obama, the entire worldwide applauded the confirmation that American society had evolved and seemed to have changed. It is undeniable and worthy of praise. But, this evolution that has occurred over two centuries has been long and progressive. It was possible thanks to the self-sacrifice, courage and perseverance of people like these three dentists, despite facing adversity at every turn. An homage to their memory is, therefore, undeniable. http://en.wikipedia.org, George Franklin Grant, 2009, p. 1.
http://www.answers.com, Nathan Cooley Keep, 2006, pp.1-2. Hyson John Jr, African-American dental surgeons and the U.S. Army dental Corps: a struggle for acceptance, 1901-1919, Office of the chief of the U.S. Army Dental Corps, Virginia, date unknown. Kaspi André, La guerre de Sécession, Les Etats désunis [The Civil War, the Disunited States], Découvertes Gallimard (éd. ), Paris, 1992. King John E., Highlights in the History of the U.S. Army Dentistry, Office of the chief of the U.S. Army Dental Corps, Virginia, 2002. Ott Chris, “Freeman, Robert Tanner (1846-1873)”, in http//:www.ada.org, 2007-2008, p.1. Ott Chris, “Grant, George Franklin (1847-1910)”, in http//:www.ada.org, 2007-2008, p.1. Riaud Xavier, L’influence des dentistes américains pendant la Guerre de Sécession (1861-1865) [The influence of dentists during the Civil War (1861-1865), L’Harmattan (éd. ), Collection Médecine à travers les siècles [Medicine throughout history Collection], Paris, 2006. Riaud Xavier, Les dentistes, détectives de l’Histoire [The dental detectives of history], L’Harmattan (éd. ), Collection Médecine à travers les siècles [Medicine throughout history Collection], Paris, 2007.
www.countaway.harvard.edu, Harvard Medical School, Boston, personal communication, 2006. 1 Hyson, John Jr, African-American Dental Surgeons and the U.S. Army Dental Corps: a struggle for acceptance, 1901-1919, Office of the chief of the U.S. Army Dental Corps, Virginia, date unknown. 3 Http://en.wikipedia.org, George Franklin Grant, 2009, p.1. 4 Http://www.countaway.harvard.edu, Harvard Medical School, Boston, personal communication, 2006. 6 Http://www.answers.com, Nathan Cooley Keep, 2006, pp. 1-2. 7 Riaud Xavier, Les dentistes, détectives de l'Histoire [The dental detectives of history], L'Harmattan (ed. ), Collection Médecine à travers les siècles [Medicine throughout history Collection], Paris, 2007. 9 US Patent 638, 920, December 12, 1899. 10 Ott Chris, “Grant, George Franklin (1847-1910)”, in http://www.ada.org, 2007-2008, p.1. 11 The Knights of Pythias is a fraternal society with the same function as the Stone Masons. It has rituals, codes and organizes ceremonies of a religious vocation. Louis Armstrong was one notable member. 16 King John E, Highlights in the History of the U.S. Army Dentistry, Office of the chief of the U.S. Army Dental Corps, Virginia, 2002.